In these lessons, we will learn how to solve comparison word problems using either bar models or comparison bars. The following diagrams show the three types of comparison word problems: Difference Unknown, Unknown Big Quantity, Unknown Small Quantity. Scroll down the page for examples and solutions. There are three main types of comparison word problems. Connie has 15 red marbles and 28 blue marbles. How many more blue marbles than red marbles does Connie have? This is a subtraction problem. Connie has 15 red marbles and some blue marbles. She has 13 more blue marbles than red ones. How many blue marbles does Connie have? This is an addition problem. Connie has 28 blue marbles. She has 13 more blue marbles than red ones. How many red marbles does Connie have? How to solve comparison word problems using Bar Models or Tape Diagrams? This video explains how to use bar modeling in Singapore math to solve word problems that deal with comparing. This technique of using model drawings to solve word problems is recommended by the Common Core mathematics standards. This video employs a visual way to solve world problems using bar modeling. 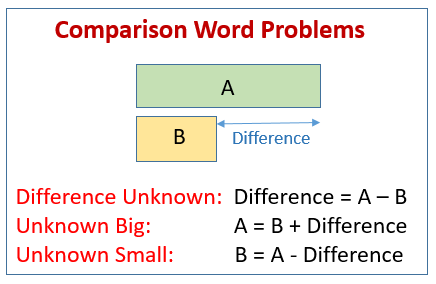 This type of word problem uses the comparison model. Because the part is missing, this is a subtraction problem. The Nature Center has a collection of snakes. The redbelly snake in the collection is 9 inches long. The eastern ribbon snake is 21 inches long. How much longer is the eastern ribbon snake than the redbelly snake? How to solve comparison word problems using Comparison Bars? This is another strategy that we can use for story problems that involves comparison. 1. Bob has 14 crackers. Steve ate five fewer than Bob. How many did Steve eat? 2. David has 5 marbles. Anna has 8 marbles. How many more does Anna have than David? 3. Ellie has 9 goldfish. Laney has 5 more goldfish than Ellie. How many goldfish does Laney have? 5. Mark earned $428 doing yard work. Troy earned $186. How much less did Troy earn? 6. Billy has 679 gumballs. He has 278 more gumballs than Lee. How many gumballs does Lee have? 7. Jake has 219 bottlecaps. Then, he found some more. Now he has 347 bottlecaps. How many bottlecaps did he find? Claire has 8 marbles. Sasha has 15 marbles. How many more marbles does Sasha have than Claire? How to use the Comparison Bars? 1. Bill read 5 books. Beth read 2 more books than Bill. How many books did Beth read? 2. Beth read 8 books. Bill read 3 fewer books than Beth. How many books did Bill read?